This looked familiar. A lot like last year actually. 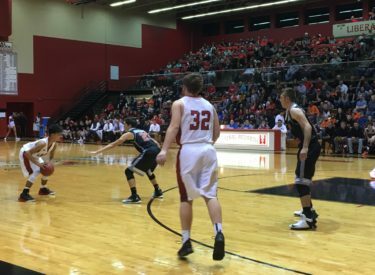 Trailing by as many as 10 in the first half and by eight at the half, the Redskins rallied to defeat the #2 class 4A division 2 Holcomb Longhorns 60-56 Friday night in front of a frenzied Big House crowd. Liberal won without injured Deladris Green who averaged 15 points and 10 rebounds a game last year. The Redskin game out red hot making three of their first four 3’s on the way to leads of 17-10 and 22-16 before leading 22-18 at the end of one quarter. The Redskins led 26-20 before the Longhorns bullied Liberal on the boards on the way to a 18-2 run to lead 38-28. Holcomb’s tall timber of 6’8″ junior Kobe Dickson and 6’7″ Conner Vancleave established position in the lane with Liberal’s tallest player at 6’5″. The Horns led 38-30 at the half. The Redskins rallied in the third trailing 46-44 after three. A Euro step lay-up by Cade Hinkle gave the Redskins a 50-49 lead with 4:41 to play in the third. Liberal extended that lead to 52-49 with 2:28 to play and 55-51 with 1:18 to go. Liberal led 56-51. The Redskins connected on 13 of 14 free throws. Hinkle went eight of nine at the foul line and scored 19. Kaiden Bigham scored 14 and was 4-4 at the line. Liberal defeats Holcomb for the first time since the 2010-11 season after the Longhorns won five straight in the series. Holcomb won state in 2014 and 2015. Liberal plays at Guymon at about 8 Tuesday night on 1270 and kscbnews.net.